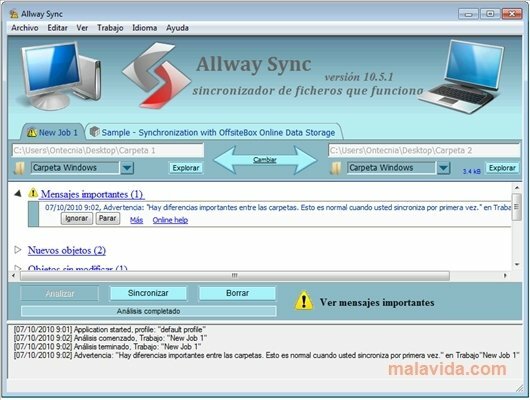 Allway Sync is a perfect utility to synchronize folders in a very simple way and with plenty of information. Although these programs usually try to be very transparent and hardly bother the user, Allway Sync offers a lot of information so that the user always knows what is happening. This makes it very good to control it, but a bit stressful for new and less experienced users. Despite everything, synchronizing two folders is very easy with Allway Sync. You'll only have to create the task, indicate both folders and the program will ask you for the appropriate indications depending on the problems that it encounters. These indications can range from knowing which is the main folder to receive notification about the all the contents that has changed and that will be overwritten. Once everything is configured, the truth is that downloading Allway Sync can be the best possible way to synchronize Windows folders. Furthermore, Allway Sync also works with USB memories, external hard drives and via web. So if you want to use it to perform periodical backups, you'll only have to indicate it.